A Sombrero is a popular libation of Maine staple Allen's Coffee Flavored Brandy mixed with milk on ice. 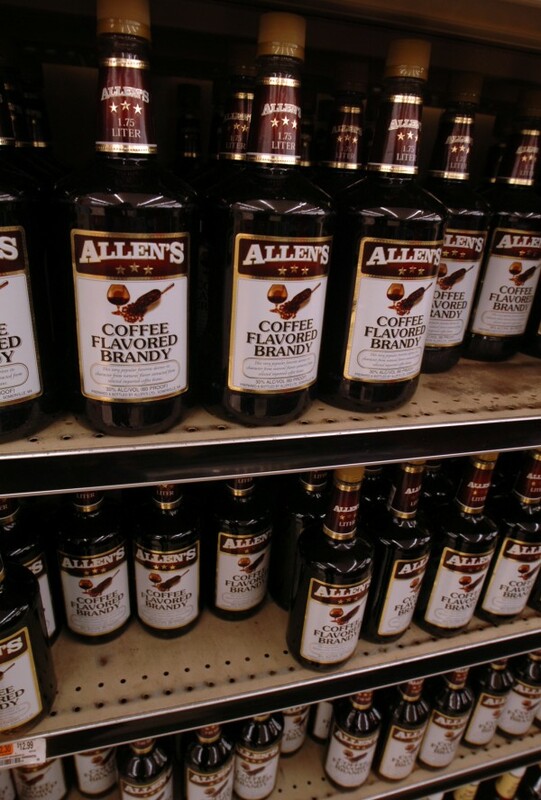 Allen's Coffee Flavored Brandy lines the shelves of a local grocery store in this 2006 photo. 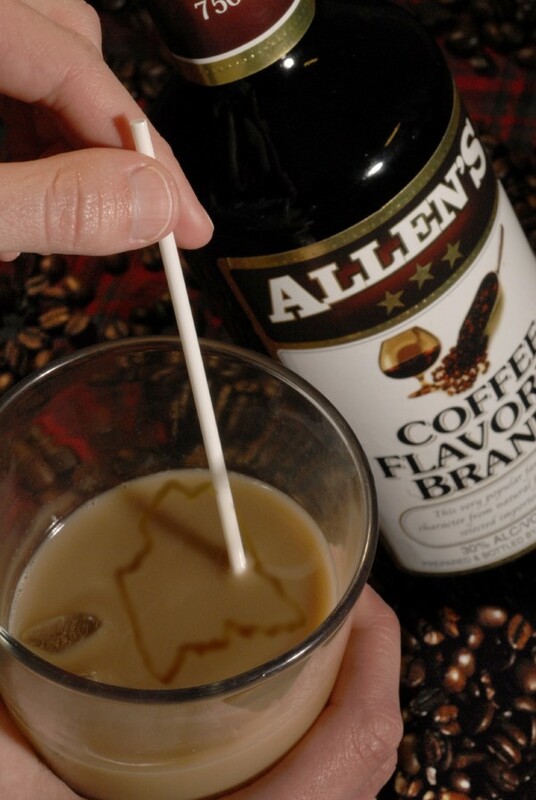 ELLSWORTH, Maine — For the first time in five years, sales of Allen’s Coffee Flavored Brandy in Maine have slipped below $12 million and 1 million bottles for the calendar year. The coffee-flavored liquor, produced by M.S. Walker Inc. in Somerville, Mass., has long been the top-selling hard liquor in Maine, according to statistics compiled by the state Bureau of Alcoholic Beverages and Lottery Operations. Each year, the bureau releases a list of the top 25 selling units of liquor in the state. The bureau bases its list on the number of cases sold and separately tracks different sizes of the same brand. Four different sizes of Allen’s Coffee Flavored Brandy routinely appear among the top 10 spots on the list. For 2011, different sizes of Allen’s were ranked first, third, fourth and ninth on the list. The largest bottle, 1750 milliliters, was the top-selling unit in Maine last year with 56,159 cases sold, with each case containing six bottles. The smaller the bottle of Allen’s, the fewer cases of it sold in 2011, as is typical every year. The total sales figures for all four sizes of Allen’s Coffee Flavored Brandy in 2011 was 988,123 bottles sold with a retail value of $11,991,937. The most recent year during which fewer than 1 million bottles of Allen’s sold in Maine for less than $12 million was in 2006. The brand of alcohol had its best year ever in Maine in 2009, when 1,065,108 bottles of various sizes sold for a total retail sales value of $12,953,850. Tim Poulin, director of operations for the state bureau, said Tuesday that, despite the decrease in the liquor’s sales in Maine, it remains the most popular brand in the state by far. Coffee-flavored liquors generally sell well in Maine, he said, but none compare to Allen’s. The bureau does not keep statistics on the sales of beers, wines or other alcoholic drinks such as hard lemonade or tea, Poulin said. Trailing behind Allen’s sales, 142,065 bottles of Captain Morgan’s Spiced Rum were sold in Maine last year for a total retail sales value of $3,428,710, which is the second highest value total among the top 25 units of liquor. Second in terms of volume in 2011 was Orloff Vodka with 276,982 bottles that sold for a retail sales total of $2,727,341. Bacardi Light rum, which sold 113,822 bottles in Maine last year for a retail sales total of $2,417,571, was ranked fourth for both value and volume. No other brand appears on the state’s Top 25 list more than once.